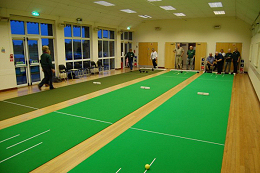 We are the Chieveley Short Mat Bowling Club, formed in April 1999. The club currently has some 30 Members drawn from Chieveley and neighbouring villages (from Thatcham & Kintbury in the south, to Lambourn, Compton & Wantage in the north). Membership is open to any person, young or old. If you would like to join this friendly and growing club please contact our Secretary, or just come along to a club meeting. We meet in Chieveley Village Hall on each Monday afternoon (2.15pm - 5pm), and each Thursday evening (7.15pm - 9pm). Tea/coffee and biscuits (cakes perhaps if a member's birthday!) are available at a mid-time break. New to short mat bowls? The only essential requirement for anyone wishing to play is use of flat-soled shoes.